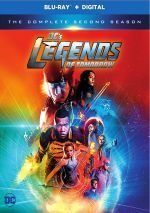 A superhero team created for TV, DC’s Legends of Tomorrow returns for more action and adventure. This three-disc set includes all 17 of Season Two’s episodes. The plot synopses come from IMDB. Though the inclusion of Einstein feels gimmicky, “Time” still delivers a solid start to Season Two. It manages a nice mix of action, intrigue and comedy to bring us a lively opener. Ah, the Justice Society, the 1940s precursor to the more famous Justice League! Legends takes major liberties with JSA members – it includes almost no one from the 1940s group – but that’s understandable and unavoidable. “Society” tends to “go silly” more often than I’d like, and S2’s tendency to treat the Legends as a band of bickering goofballs may get old, but the show still offers reasonable fun. Boy, does a CG monster shown here look awful, though – the series’ budget can’t muster the quality needed to pull off fully animated characters. After two good episodes, S2 sags with the mediocre “Shogun”. The show does little more than embrace clichés, so despite a few solid action scenes, the program’s overall impact seems lackluster. Civil war zombies. Alrighty then! That’s not the only problem with “Abominations”, as it continues the series’ affection for moralizing. The episode makes sure we know that racism and sexism are bad. I already was aware of those conceits, so I don’t need Legends to tell me. The mix of silly and condescending makes “Abominations” a relatively weak show. With McDonough and Lance Henriksen in tow, “Compromised” allows S2 to rebound. The move to the 80s also adds some spark, so the episode gives us a fun, involving tale that gives me hope the season will perk up from here. As our new character, Nate seems awfully similar to Ray, and his powers do little more than copy those of Colossus from X-Men. As played by Zano, he becomes likable enough, but he doesn’t add much that I’d call fresh. That factor aside, “Outlaw” works reasonably well. It plays into too many Western clichés but it still gives us some good twists, especially and it lets Mick be Mick and show his semi-dark side. Here comes S2’s big “crossover episode”! Unfortunately, its story elements come out of nowhere because it connects to episodes from three other series, all of which aired prior to this one. Sure, “Invasion” gives us a quick recap at its start, but it still feels out of the blue. If you can watch the related episodes from the other series first, that’s best. If not – which was the case for me – “Invasion” still entertains, as it offers good action and intrigue. I would’ve preferred to see it in it original sequence – as the fourth of four programs – but I’ll survive. Still, it would’ve been nice if the package included the three episodes from the other series in this package as well. The Chicago Way: “The Legends track a Time Aberration to 1927 Chicago and realize they've been set up by Eobard Thawne (Matt Letscher), Damien Dahrk and the newest member of the Legion of Doom: Malcolm Merlyn (John Barrowman). As soon as I read this episode’s title, I figured it’d concern itself with 1920s gangsters. While “Way” leaves few clichés unturned, it still churns out a good show, as it offers fun/action along with a nice advancement of various arcs. As teased at the end of “Way”, Rip returns in a clever manner, and his presence brings a spark to “Art”, especially in his use as a film director. The main plot moves ahead well and a lot of delightful elements appear here – including a “cameo” from a famous filmmaker. Expect a plot-heavy episode from “Doom”, as it devotes much of its time to narrative arc elements. That makes it productive but less entertaining than its recent predecessors. Turncoat: “The Legends travel to the winter of 1776 to protect George Washington (Randall Batinkoff) during the American Revolution, but Sara (Caity Lotz) is forced to send out Nate and Amaya (Maisie Richardson-Sellers) when things don't go as planned. Any show that opens with the assassination of George Washington gets my attention, even if I know it won’t “stick”. “Turncoat” uses other aspects of its Revolutionary War setting to its advantage and becomes a lively, entertaining episode. After so many trips to the past, it’s nice to see Legends push to the future every once in a while. Alas, we spend little time in the 31st century, as most of the show dallies in Arthurian times. This mostly works well, as the episode pokes at those myths in a fun manner. Is it a spoiler to relate that the Legends don’t end up stranded in prehistoric times? “Lost” actually splits its time between that side of the story and a battle in Rip's mind, neither of which works all that well. While the show moves along the overall season arc, it’s not one of the more entertaining experiences. If you think you’ll get through the episode without a “Houston, we have a problem” quote, think again. That predictable moment aside, “Moonshot” offers a mostly enjoyable episode, as it mixes action and plot well. I must admit the show’s connection of the Spear as an obvious influence for Tolkien’s “One Ring” seems a little cheesy. That said, “Spear” treats the material in a surprisingly dramatic way, as it lacks the cutesy factor I expected. The episode ratchets up toward the climax nicely. “Alternate timeline” shows like this tend to be fun, mainly because they get to take goofy liberties with the characters. That side of the program adds cleverness and helps lead the season toward its finale. As expected, “Aruba” delivers a big action spectacular that wraps up the whole Spear thread. It goes a little kooky with all its time-rending machinations, but it still throws out a lively, exciting finish. At the start of S2, I had some doubts about how well it’d work, as I feared it’d just be one “adventure in time” after another. However, the overall narrative arc held the year together and turned it into a pretty strong year. Legends of Tomorrow appears in an aspect ratio of approximately 1.78:1 on these Blu-Ray Discs. As occurred for S1, Season Two offered appealing visuals. Overall sharpness seemed solid. A little softness impacted a few interiors, but the majority of the episodes delivered tight, concise imaging. I saw no signs of jaggies or shimmering, and edge haloes remained absent. The shows displayed no source flaws either. Colors tended toward standard teal and orange, but the variety of eras/settings allowed for some variation to that theme. Within stylistic choices, the hues appeared well-rendered. Blacks came across as dark and deep, and shadows followed suit. Low-light shots displayed nice clarity and smoothness. All in all, the episodes provided positive picture quality. In addition, the season’s DTS-HD MA 5.1 soundtrack gave us immersive material. With tons of action on display, the shows boasted active use of all five channels. The elements combined in a satisfying manner to create vivid, engaging soundscapes across the year. Audio quality also appeared fine. Music was lively and full, while speech appeared natural and distinctive. Effects worked well, as they showed good accuracy and range. Low-end seemed tight and full. I felt the audio complemented the action nicely. We get 14 Deleted Scenes spread across nine episodes. These fill a total of 12 minutes, 56 seconds and largely present a little extra character development/exposition. For instance, we see Jackson and Stargirl flirt more than in the finished shows. Some mildly interesting material arrives, but nothing great appears. On Disc Two, a featurette called Allied: The Invasion! Complex goes for nine minutes, 56 seconds. 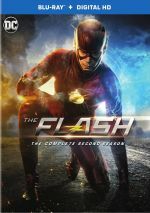 It features comments from executive producers Marc Guggenheim, Andrew Kreisberg and Phil Klemmer, comic book historian Alan Kistler, and writer David Kob. “Complex” looks at story/character areas and challenges related to the multi-episode “crossover” shows. It gives us a passable overview but not one with much depth. Disc Three presents a Gag Reel. It lasts six minutes, 39 seconds and shows the usual roster of silliness and goof-ups. Don’t expect much from it. 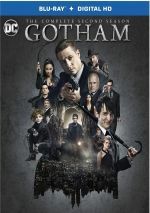 Also on Disc Three, a 2016 Comic-Con Panel takes up 29 minutes, 56 seconds and includes Guggenheim, Klemmer, and actors Caity Lotz, Victor Garber, Franz Drameh, Nick Zano, Maisie Richardson-Sellers, Arthur Darvill, Brandon Routh, John Barrowman and Dominic Purcell. They give general thoughts about Season Two. These Comic-Con chats always tend toward hyperbole, fluff and promotion. This one proves no different. Panels like this are more interesting as actual previews of the upcoming year – when viewed after we’ve seen the season, the discussions prove pretty boring. 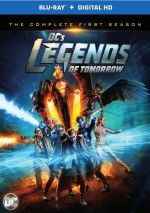 With Season Two of Legends of Tomorrow, we get a satisfying continuation of the series. It brings us a solid overall arc that comes together with many fun, exciting shows. The Blu-rays offer very good picture and audio as well as some decent supplements. I look forward to Season Three.